Remember how I said that St. Louis is known for three things? Beer was one of those three–baseball and toasted ravioli being the other two. So let’s talk a little beer. 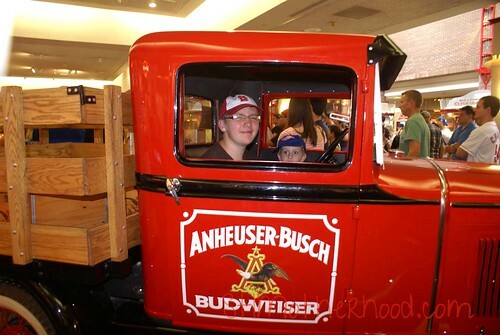 St. Louis and the Anheuser-Busch brewery are forever linked, and the founding family of AB has done tons of cool things for moms. You know, beside making us margarita flavored beer. Without Gussie Busch we may not have awesome things like Busch Stadium (he built the first one for his Cardinals) or Grant’s Farm. Yep, it was Gussie that opened up the family estate to tourists and established the long held tradition of feeding your children to tiny goats. We can also thank Gussie for St. Louis’ number one animal mascot–the Budweiser Clydesdales. He gave his dad a hitch of six beer pulling Clydesdales to celebrate the end of prohibition back in 1933. Now back to the beer. 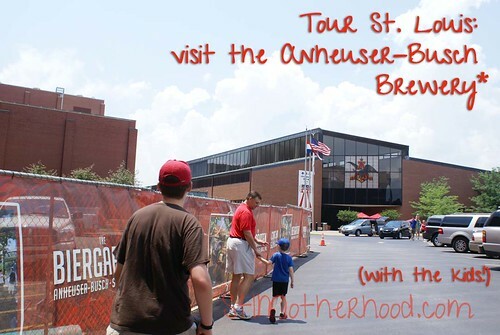 The Anheuser-Busch brewery in St. Louis is open for tours. And yes, it’s is a family-friendly tour. It’s also totally free, so it’s fun touristy thing to do if you run out of ideas and want to do something that involves local history, walking and free beer. The tour starts in the main lobby where the company has tons of memorabilia set out. Yes, most of this is beer related, but the kids will get a kick out the old truck (which they can get into), some of the racing history and information on the Clydesdales. While you’re waiting, mom and dad can snag a sample of whatever is on tap or check out the gift shop for a Clydesdale toy. The tour takes about an hour and involves a lot of walking. You can take a stroller, but it’s a bit of a pain due to the escalators and steps. However, the brewery is very friendly and handicap accessible, so a tour guide will give you hand and either show you to a secret elevator or hold the stroller for you. The tour’s first stop is the Clydesdale stables, one of the historic buildings on the company campus. Back in the day, the Busch family lived right next to their factory and the stable is all that remains of their living quarters. (Remember, they were brewing beer before cars, so it made sense to live next door to your business!) 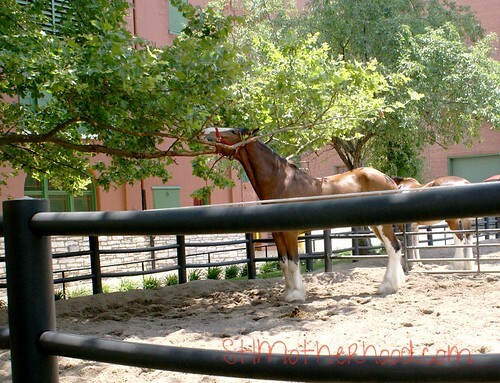 The stable is home to the St. Louis hitch, so there’s always a couple horses around to visit. Next you’ll see the giant vats where the beer ages then over to another building where the guides will talk about how beer is made and show you more behind the scenes factory stuff. The last stop is the bottling plant were you can see the beer being packaged. Finally, they’ll load you up on a tram and give you a ride back up to the hospitality room. 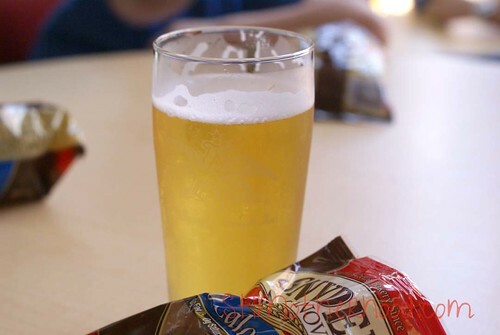 The hospitality room serves up pretzels and two samples of beer for the adults. Kids and non-drinkers can help themselves to free soda.